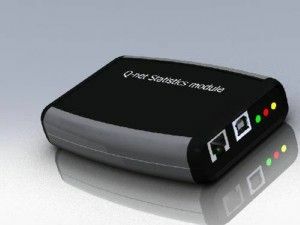 SD04 module is necessary when statistical data has to be stored in Q-net Basic or in Q-net Basic Plus. The module is constantly connected to the system via UTP cable to the OE01 distributor. In case the data has to be downloaded, the SD04 module has to be connected to the PC (with SH04 software installed) with USB cable. On the side of the unit there are two leds, one of them shows power connection, the other shows the data connection. This entry was posted in Basic others. Bookmark the permalink.